“Decompression” is the best word to describe my rare night out with the guys last Tuesday. The idea for the outing sprang up last week when I saw that the San Francisco Giants were coming to town to play the Atlanta Braves. Carla was amenable to giving me the night off, so plans were set in motion. Brian, left, and Daniel, right, met all the requirements of compatriots for a guys’ night out: they’re guys. 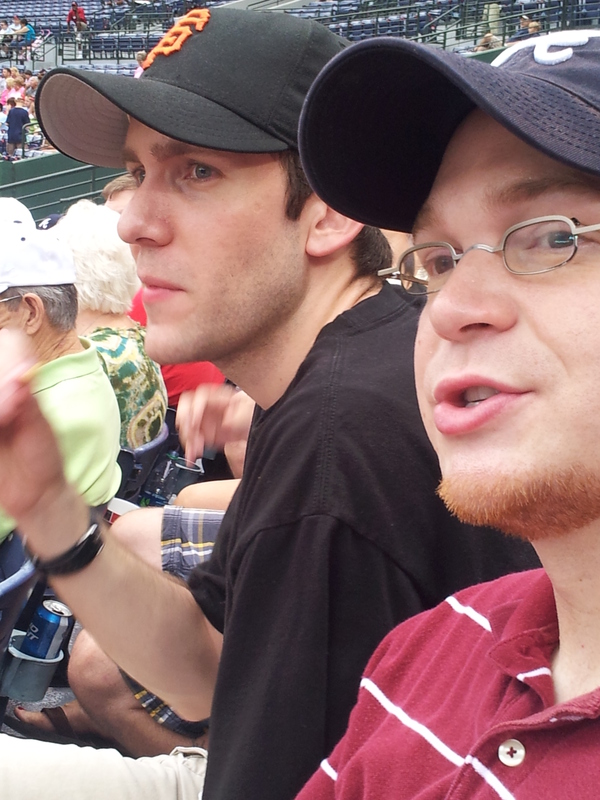 I haven’t seen a Braves game since my buddy, Bob, moved away several years ago, and I felt it was time. My friend, Brian, is a life-long fan of the Giants, and our mutual friend, Daniel, lives in Grant Park, about a mile from the stadium. Not only did he provide free parking, Daniel’s baseball knowledge combined with Brian’s pop culture omniscience set the tone for the perfect guys’ night out conversation. Admittedly, Daniel is better friends with Brian, based on a relationship that dated back to when the two were in seminary at Mercer’s McAfee School of Theology, but baseball talk is a universal language, and our conversation was easy and constant all night. It’s been my experience that when guys attend a ball game, they talk about all of the previous times they have been to ball games. Over time, our memories fade, and we are left more with impressions than the ability to relive the experience play-by-play. Details such as who hit home runs, who pitched, special promotions, the importance of the game, whether someone achieved a milestone or broke a record, who won, weather conditions and run-ins with unruly fans all coalesce to form the substance of guys’ ball game conversations. 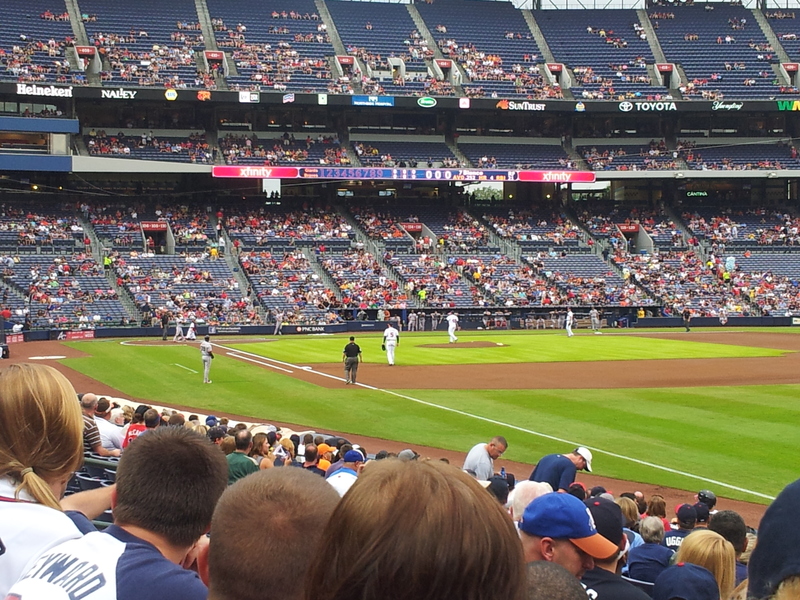 Our view from the lower level, first base side in right at Turner Field. None of this talk was of earth shattering importance, but that was precisely the point. No problems to solve, no children to console, no “honey-do” lists or sharing our feelings. The two married guys were only interrupted by phone calls from our wives once a piece. That’s notable. For Braves fans, Tuesday night was completely forgettable. The Braves lost 9-0, thanks mostly to a poor outing by Jair Jurrjens and clutch hitting for the Giants by Leesburg, Ga., native Buster Posey, who drove in five runs. But the outcome didn’t matter. For a few hours we were just guys talking about baseball. I’m sure our analysis was flawed, our view of bang-bang plays obstructed and our stories exaggerated. Still, the evening met all the criteria for a great night out. Afternoon showers that stopped just before game time gave us a cooler-than-normal climate to enjoy being at “The Ted.” Our first level seats, bought off the Internet for a steep discount, were ideal for watching Jason Heyward track down fly balls hit to right field. 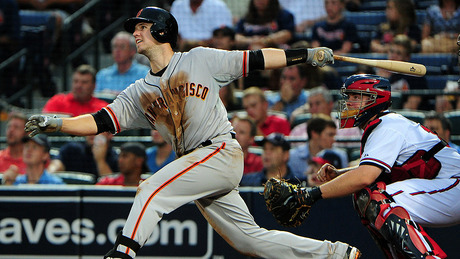 Buster Posey drove in five of the Giants’ nine runs. Oh well, if you have to get beat by somebody, may as well be a Georgia boy. We weren’t accosted by any obnoxious fans, and there were no drunk loudmouths to ruin the evening. Through social media I learned that our church friends, the Akins, were also at the game, and when I looked up at the giant screen between the first and second inning, I saw more church friends, the Willises, laughing it up and having a good time. I learned the next day that our friends from Macon, the Brownes, were also at the game. It was a veritable family reunion. And speaking of family, I’m beginning to feel that it’s time to take the boys to a game. If our friends, the Ortons, can take their almost one-year-old son, Jack, then I think we can stand to get Harris and Carlton to their first game. Barron is old enough to understand what’s going on now, and Carla always enjoys a chance to people watch. There will be a time when my whole family makes it to a game, but sometimes you have to hang out with just the guys. It’s just necessary. At the risk of sounding like the “Most Interesting Man in the World,” I don’t need a guys’ night out often, but when I do, I like the Atlanta Braves. Stay baseball fans, my friends. Where do you like to go for guys’ night out? Where do you send your husbands or boyfriends when they need to get away or you need them to get away? Have you had memorable nights at a Braves’ game? Join the conversation by sharing your comments below. This entry was posted in Uncategorized and tagged Atlanta Braves, baseball, Buster Posey, contemporary South, family, guys, guys night out, Jair Jurrjens, Jason Heyward, Lance Elliott Wallace, Lance Wallace, Macon, New South, New South Essays, NewSouth, relationships, South, Southern, Southern Culture, Southern Living, Southern sports, Southerners, the South, Turner Field. Bookmark the permalink.